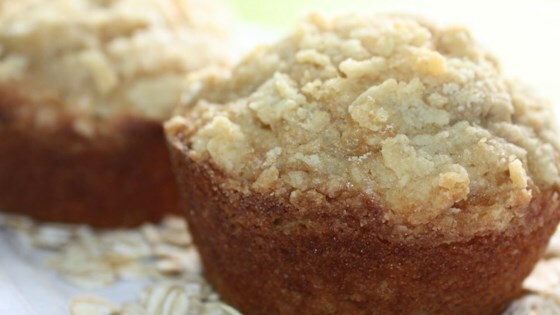 "If you like peanut butter and banana together, these muffins are for you." Combine 1 cup flour, oats, 1/3 cup brown sugar, and baking powder. Whisk together milk, peanut butter, banana, egg, oil, and vanilla. Add banana mixture to dry ingredients, mixing just until moistened. Fill prepared muffin cups 3/4 full. In a small bowl, stir together 1/4 cup flour, melted butter and 2 tablespoons brown sugar. Sprinkle topping evenly over muffins. Bake in preheated oven for 18 minutes, until golden brown. Serve warm. I thought these muffins were very good - a unique flavour, and very easy to prepare. I've made them more than once. These are really flavorless. You can't taste the banana at all, and only a vague hint of peanut butter.